Some days, you may roll out of bed and wonder why the hell you’re working a job that doesn’t make a difference where your boss treats you like crap. You could come work at Gizmodo Media Group. Or you could wash that sense of ennui away by realizing it could be worse. You could be a scientist at the Environmental Protection Agency (EPA). On Tuesday, the Union of Concerned Scientists (UCS) released the results of a survey it conducted about the work lives of federal scientists. They show the EPA is home to some of the most hard up scientists in the federal government. Many respondents expressed frustration that politics gets in the way of their jobs. Morale at the agency seems low, with lots of empty desks as coworkers shuffle off to greener pastures and aren’t replaced. 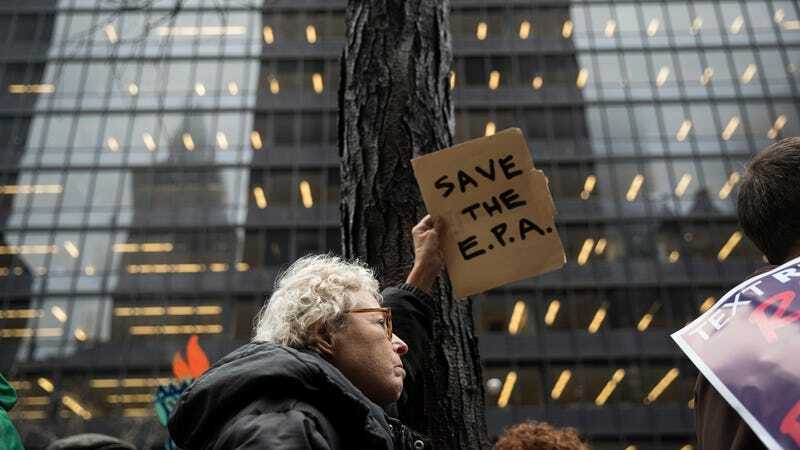 The ways in which the EPA has wiped science out of its decision making are too numerous to list here, but suffice to say everything from air quality to climate change is under fire. A whopping 70 percent of respondents at the EPA said they strongly agreed or agreed that “the presence of senior decisionmakers who come from regulated industries or have financial interest in regulatory outcomes inappropriately influences agency decisions.” Eight-two percent of respondents said political interests are standing in the way of creating science-based policy. And 61 percent said that scientific advisory boards—outside experts convened to provide impartial advice—aren’t as good as they were before Scott Pruitt stocked them with industry types or wiped them out completely. The survey responses were collected in February and March this year, making them the first comprehensive survey of scientists under the Trump administration. UCS sent the survey to 63,000 scientists across 16 agencies and netted 4,211 responses. Those agencies were largely ones responsible for enforcing regulations or making new ones. Though it includes pure science agencies like the U.S. Geological Survey, others like NASA or the National Science Foundation weren’t included. For the EPA, UCS sent out 14,856 and got 449 full responses, a response rate of a little over three percent. It’s possible scientists were too fearful to respond, didn’t care enough to, or that there’s a large contingency of researchers quietly sitting at their desks, happy the deep state is finally getting its comeuppance. Turnover at the top of the EPA after the survey could lead to different responses in the next round. Andrew Wheeler, the man who is acting as the replacement for noted luxury lotion enthusiast Scott Pruitt, has been somewhat more transparent. He’s sent out an email to staff laying out his goals, something his predecessor never did. That said, he’s also a former coal lobbyist who has pursued the same anti-science agenda as Pruitt. It’s not all bad news around the federal government. Morale has increased at the Food and Drug Administration and other agencies like the National Oceanic and Atmospheric Administration (which currently lacks a permanent leader) are humming along with minimal interference. Nearly two-thirds of respondents said that scientific integrity policies, federal guidelines put in place to make sure science isn’t hurt by politics and scientists aren’t silenced, have been observed. Many scientists also know their whistleblower rights. If there’s something you want to blow the whistle one, hit us up at tips@earther.com.